No, don’t get excited, the comb that’s actually in the sculpture, I put there as bait, hoping they’d work off it. The comb that’s gorgeous and full all around the sculpture but not touching it? The bees put it there. First, if you have no idea why there is a tiny living room in my bee hive, see the Bees in the Living Room previous post. However, I think I have a good idea of what’s going on. It’s not quite apparent in this picture, but the bees draw comb down, not up. This is more obvious if you look at the bottom of the box that I took off the top of this one. The “blank” areas you see here are filled with comb hanging from above. It’s also obvious if you know anything about bees, which I apparently do not. So, humans, lacking wings and such, build their homes from the ground up. Bees, possessing wings and such, build their homes from the ceiling down. Thus, if I want them to build comb around my home, I’ve got to put it on the ceiling, not expect them to build up from my floor. Next plan: attach the furniture to the floor as shown above, invert it and hang it in the hive. Update to follow. For the past several years, I’ve been experimenting with creating sculpture in collaboration with my bees. My first piece, featuring a husband and wife entombed in comb, was my favorite. It was clever (I thought), whimsical and pleasing to the eye. My other attempts (a rolling eyeball similarly entombed; LED christmas lights wending their way through wax, etc.) were interesting, I thought, but lacking in artistry. Yes, there are some objects entombed in comb in a way no human could create on their own…but so what? Beyond the “wow, how did you do that” effect, there was little to recommend them. Proof of concept, yes. Art, no. For this year’s sculpture, I wanted something a bit more elaborate and thought provoking (but at the same time, no clobber-you-over-the-head symbolism). See the photo below for my start. That’s a cheese plate on the bottom. The dollhouse pieces I picked up years ago at a now defunct dollhouse specialty store up on Phinney Ridge, figuring I’d do something with them some day. The cheese plate comes with an attractive glass dome that I was hoping the bees would draw comb down off of, so I drilled a hole in the bottom for them to come and go. I’ve got a little fake rug I’m going to try to cover the hole with at the end of the project. The trick here, though, is going to be to get the bees to build inside my little dome. No reason they should or shouldn’t, it’s sort of up to them, but obviously I’d like to improve my chances. My first attempt was to melt a bit of existing comb onto the top of the dome and then drip some honey inside. I removed seven frames from a honey super and placed the whole set-up inside an active and growing hive. The result: the bees came in, cleaned out the honey and left the dome alone. Then I remembered that bees will huddle on brood (eggs) to keep them warm, acting as nurse maids. 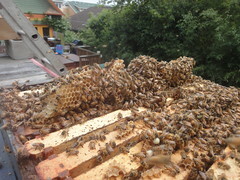 It’s a strong instinct: if you add brood anywhere in your hive, it’s almost guaranteed they’ll converge on it quickly. 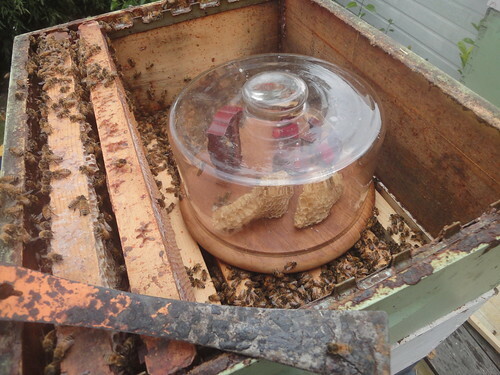 As luck would have it, as I was inspecting my hives this week, I realized that I had put in a half-sized “honey super” frame in a full-size “brood chamber” box. 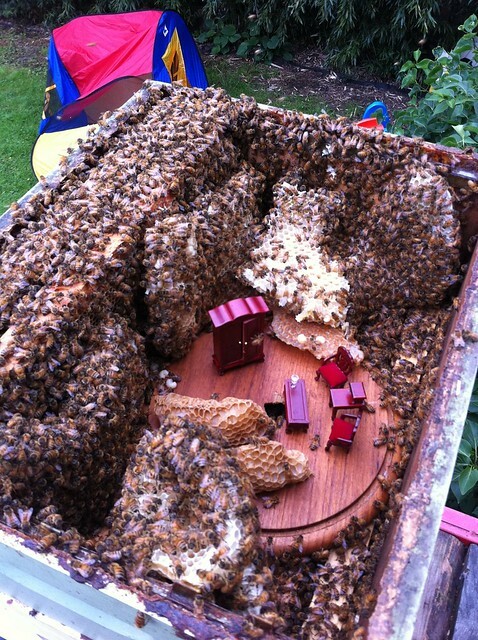 As a result, there was an empty space that the bees had filled with comb…and brood. Perfect! Brood comb unattached to anything just waiting to be plucked (right). I had some difficulty getting the comb into the sculpture, though. 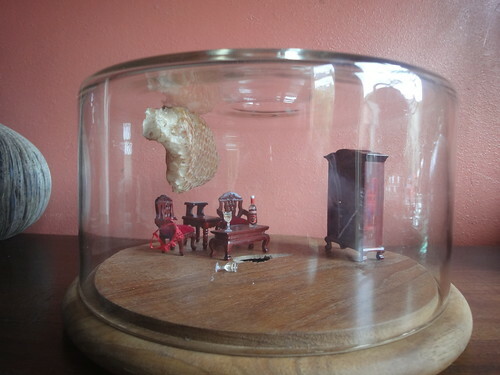 At first, I tried melting the wax onto the glass dome the same way I had the early comb. Unfortunately, the larvae that were in the cells on the exposed edge of the comb proved wet and slick, and it refused to stick. In the end, I just lumped some in on the floor of the “room” and hoped they would build up. Some of the comb was distorted in the process, but hopefully it didn’t kill the growing larvae. This was yesterday. As of today, as you can see, the bees were still teeming inside the sculpture, and had even sealed the comb to the glass (as well as knocked the vodka off the table and misplaced the bra I had left on the chair). No new comb had been built, but that’s not surprising after just a day. I’ll check back in a week. 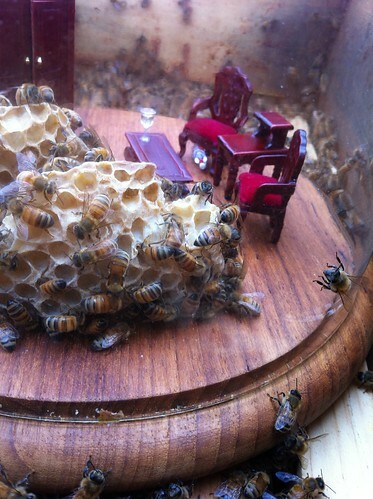 Got an e-mail from local artist and dorkbotter Joseph S. today, asking whether he could come over and mic my bees. He says he’s working on a musical project that needs bee sounds, did a search for Seattle-area beekeepers and turned up l’il ol’ me. Nice coincidence, as I’m a huge fan of Dorkbot, a techno-arts group that meets monthly to share their work and inspire each other. The Seattle chapter is led by a committee headed up by Dork Overlord and fellow Hive-Minder Shelly Farnham. Their tag-line: “People Doing Strange Things With Electricity”. Awesome. Anyway, the mic’ing idea has me pretty excited. I was just thinking yesterday that while I often blog about the bee’s behaviors and post photos and videos, there’s a whole sensual side that you really have to be there to appreciate (no pun intended). The sound of the hive is one aspect. It varies depending on time of day and whether, but when it’s sunny and they’re active, there’s just the lightest hum in the air, punctuated by a huzz and suzz of incoming and outgoings passing close to your ear. If you pop the hive open, of course, the hum becomes a querulous buzz, almost like they’re tasting you with radar sound, knowing something’s changed, unsure whether it’s friend or foe. Knock or bump the hive, and it’s a whole different story. As a single body, they all start a hewing roarish buzz, a call to arms. If you hear that sound and your bee suit isn’t tight, it’s time to take a step back. They’re angry, or frightened or just determined, and you will get stung. If you’ve got a smoker or maybe a spray bottle of sugar water, now’s the time to lay it on. It’s like giving Benadryl to a crying baby, except faster. The menacing roar of the hive, the zapping buzzing of bees making kamikaze runs at your head suddenly melt away and you’re back to a low coo, no more fearsome than a burbling brook. The smell of the hive is something else again. I’ve got to think a bit on how to describe it. Another day.